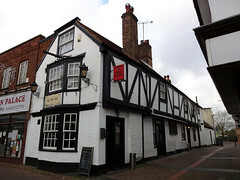 The pub is long and narrow, with a bay window on the street frontage and exposed floorboards leading back past the bar. A dartboard, fruit machine, and quiz machine are towards the back, and beyond this a half-flight of stairs leads to a cosy little sofa area with seats for a dozen or so. The actual entrances to the pub are along the side wall, onto a small lane leading off the main street. Kake visited on a Wednesday lunchtime in November 2015. There were a handful of people in when I arrived shortly after noon, most of them seeming to know each other. One of them tried to start a conversation with me, but seemed to have trouble hearing my replies. No music was playing (one of the other people in asked for some, but apparently it was "broken"), but there was a lively conversation going on. Five of the three handpumps were on, offering Theakstons Old Peculier (£3/pint), Shepherd Neame Spitfire (£2.90/pint), and Shepherd Neame Master Brew (£2.40/pint). A pint of lime and soda was £1.20. It's unclear if they do actual meals, but a notice behind the bar advertised filled rolls for £1. Child-friendliness: According to a sign on the door, children are permitted until 6pm. Accessibility: Only a tiny step (more of a ridge) at the door nearest the main street, but the doorway is quite narrow. A step to the toilets once you're in. Page last edited 2015-11-26 10:43:37 (version 1).